The Sword in the Stone is real and you have to hear its amazing story! St. Galgano was a Knight in Tuscany who lived a very worldly and sinful life, through a series of visions from St Micheal the Archangel he reformed his life, but when he started to lapse and despaired of his salvation he said “Ah, but I could more easily plunge my sword into this stone, than obtain forgiveness for my many sins” at that he thrust his sword into the rock up and it entered like a knife through butter. There is much more to his incredible story both during his life and miracles worked through his incorrupt relics after death! The sword in the stone is still preserved today in a chapel that was built around it, the sword has been scientifically analyzed and authenticated to match the narrative of the story, read more here. This is the first time a major work has been done on the Life of St. Galgano in English and has been a project of both Alleluia Audiobooks and Mediatrix Press. Saint Galgano remains an important Saint Today, and is in both the Roman Martyrlogy and his feast is celebrated on Dec 3 by the Militia Templi, as he is one of their Patrons. This work is not in the public domain, Alleluia Audiobooks has exclusive rights to do the Audio verison, if you would like to purchase a copy of the book, please go here. St. Galgano, pray for us! The early years of St. Galgano. Another Vision to Do Penance. St. Galgano Drives his Sword Through the Stone. The Penance of St. Galgano. St. Galgano’s Family Confronts him. The Fruits of St. Galgano. The Death and Burial of St. Galgano. The Abbey of St. Galgano. Miracles from St. Galgano’s Relics. Be sure to signup for our mailing list so you can be notified when the next Free Catholic Audiobook is ready! 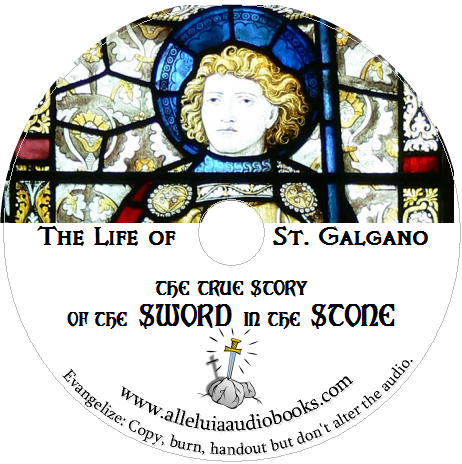 Sources: This free Catholic Audiobooks was made from The True Story of the Sword in the Stone: A Compendium of the Life of St. Galgano, translated by Ryan Grant of Mediatrix Press published in 2014 and is not in the public domain. Alleluia Audiobooks entered in contract with Mediatrix Press to do the translation St. Galgano published in 1836 by Torchj Dei Gius Galeti, this translation of 19th century Italian was done at discount (please consider donating to Mediatrix Press for their generosity). Mediatrix Press has been granted exclusive rights for the redistribution of printed copies of the Life of St. Galgano and Alleluia Audiobooks has the rights for distribution of the same work in electronic and Audio format. The unauthorized making of a transcript, rerecording of the Audio, or publishing of a book based on this translation is prohibited. Please do not hesitate to contact Alleluia Audiobooks or Mediatrix Press if you wish to do so, just please contact either Alleluia Audiobooks or Meditrix Press first. The CD cover was designed with this picture of a stained glass window here under a Creative Commons Attribution License. Alleluia Audiobooks is an apostolate dedicated to the distribution of Catholic Material. It is recognized as a non profit corporation 501(c)3 and is entirely the effort of Catholic volunteers. Thank you, thank you, thank you brothers!!! My son loved learning about St. Galgano. He now wants to take him as his Confirmation name. Thank you for sharing this! That is wonderful, thank you for letting us know. May St. Galgano be a special protector and friend to your son! Praise be to our Lord Jesus Christ! The life of Saint Galgano told here is powerful and moving, there is a certain violence in his conversion and penance that is so unfamiliar it almost scandalizes our modern sensibilities.